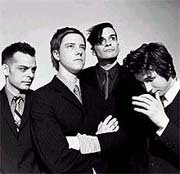 Over the course of four years, one of my favorite bands around, Interpol, has cultivated a distinctively sharp aesthetic and a refined creative writing process that produces songs that linger…The band arranges, builds, and crystallizes compositions based on guitar lines played by founding member Daniel Kessler. Paul Banks approaches songwriting imaginatively - exploring the possibilities that they offer, and challenging listeners to do the same. From their first CD "Turn on the Bright Lights" to their recent release "Antics", the delivery of the vocals has evolved from implied tension (that we all feel at times) and anxiety, to pieces that are more melodic and buoyant. The first time I heard "Untitled" off of "Bright Lights" driving home late one night, I was drawn to the alienated, indirect, and stunning sound. When I saw them live for the first time last October at the Roxy, I caught my first glimpse of what the members of Interpol looked like. Their attire is handsome, pure, and striking, showing their appreciation for the visual art of presentation. My appreciation for their beautifully simple "Bright Lights" CD cover got me the chance to write a little bit on why I love them so. Interpol is amazing at live shows. They are a solid band that's rightfully and deservingly gaining more confidence as they continue touring and experimenting. They played just about half of the songs from each of their CDs. They opened with "Next Exit" off of "Antics", and played "Evil", "Narc", first released new single "Slow Hands", and my favorite "Not Even Jail". "Bright Lights" was represented by "Obstacle 1", "NYC", "PDA", "Roland", and "Stella was a diver and she was always down", which was hugely appreciated by the entire adoring front section as one of the much cheered for encores. The lighting, straightforward, yet dramatic, enhances the experience of a live Interpol show. Architect John Pawson says, in his book Minimum, that "the minimum could be defined as the perfection that an artifact achieves when it is no longer possible to improve it by subtraction. This is the quality that an object has when every component, every detail, and every junction has been reduced or condensed to the essentials. It is the result of the omission of the inessentials." I am a serious fan of Interpol's music for many reasons, but the one that drew me in from the first time I heard one of their songs is the genuineness that I can feel in their music and that it is coming from their souls.